The Edward Via College of Osteopathic Medicine (VCOM) is located on the Virginia Tech campus in Blacksburg, Virginia. It has expanded to include a medical school on the campus of Wofford College in Spartanburg, S.C. and an upcoming medical school on the campus of Auburn University in Auburn, AL. To promote research to improve human health. In 2008, VCOM entered into an agreement with Baxter Institute’s medical clinic, dental clinic, and pharmacy allowing VCOM to use the clinic as a medical mission internship site. This partnership has expanded the work of the Baxter Clinic through mobile clinics, medical resear ch, and care which is internationally-recognized. 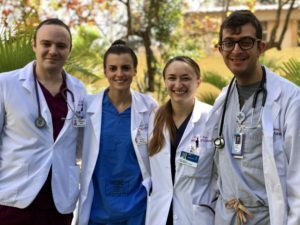 VCOM’s third- and fourth-year medical students are offered the opportunity of a one-month rotation at Baxter. While staying on Baxter’s campus to participate in the clinic’s activities, they also are extended opportunities to work with local physicians in two nearby hospitals. They gain experience by assisting in the emergency, obstetrics, gynecology, and pediatric departments. Both VCOM and Honduran medical students benefit from the exchange of knowledge resulting in a sustainable improvement of health care. VCOM and other groups that come to help the poor and downtrodden are wonderfully generous in bringing medicines and other resources that Baxter doesn’t have the money to buy. VCOM has even previously offered a First Responder Training seminar for our second and third year Baxter students. We are blessed to have VCOM assisting our clinic and partnering with Baxter to share God’s love in surrounding communities!